Muskoka extends from Georgian Bay in the west, to the northern tip of Lake Couchiching in the south, to the western border of Algonquin Provincial Park in the east. Located approximately two hours north of Toronto, Muskoka spans 2,500 square miles (6,475 km2). Muskoka has approximately 1,600 lakes, making it a popular resort destination. 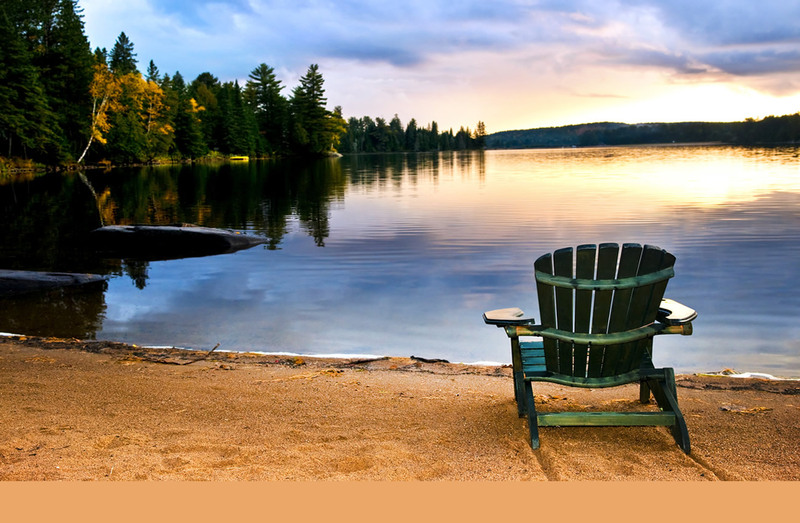 Muskoka has just over 50,000 permanent residents, but an additional 100,000 seasonal property owners spend their summers in the region every year, making this a major summer colony. First record of Muskoka was in 1615 and the territory was occupied by Indians consisting of the Algonquin and Huron tribes. The name Muskoka is thought to come from the name of a Chippawa tribe chief, named Mesqua Ukee which means “not easily turned back" in the day of battle. Gravenhurst is the first town in Muskoka covering a large portion of the southern part of the District of Muskoka. Making it known as the ‘Gateway to the Muskoka Lakes’ and since 1885 has had a tradition of welcoming gates at the entrance to the town. The town borders on two lakes and is surrounded by a number of smaller lakes. Gravenhurst has a population of 10,889 permanent residents which swells to 34,000 in the summer. Gravenhurst was named after a village in England which is mentioned in Washington Irving's Bracebridge Hall. Gravenhurst was originally known as McCabe’s Landing and later as Sawdust City. Gravenhurst became known as Sawdust City because of the large lumber industry that sprang up in the area. At one time there were 28 mills operating in Gravenhurst. James McCabe was one of the first people to service the tourist industry running a small tavern at the south end of Lake Muskoka in the 1870‘s as people came, first to settle free land and later to hunt and fish and enjoy the outdoors. The original name of Bracebridge was North Falls because of the mighty waterfall around which the community began. In 1864 when the postmaster, responsible for naming postal areas, arrived he was reading a book called “Bracebridge Hall” by Washington Irving and decided that Bracebridge would be a good name for the town. The first settlers began arriving in 1859, noting that the foaming torrent of this waterfall was well suited to running saw mills for the fledgling lumber industry, and other mills also began springing up. Situated on the Muskoka River Bracebridge was called The Falls Capital of Canada. Bracebridge has 22 waterfalls and in 1894 was the first town in Ontario to have its own hydro generating station. Bracebridge is the capital of the District of Muskoka and has the largest population, other than Huntsville, with 16,000 swelling to almost 23,000 in the height of summer. Huntsville derived its name from its first resident Captain George Hunt. In 1869 he built a small agricultural centre here and decided to make this logging settlement his permanent home. In 1870, a post office was built and the area was named Huntsville after Hunt, who also became the first postmaster. With a population of 18,000 that swells to almost 25,000 in the summer, Huntsville sits on the north edge of the Muskoka region on the rugged Canadian Shield, dotted with many lakes. The breathtaking beauty of the area began to spread and vacation resorts sprung up making it known as a popular summer vacation destination for boaters and cottagers, and acts as a western gateway to Algonquin Provincial Park. Muskoka’s most rugged and wildly beautiful area, Georgian Bay Township is a striking wilderness environment that’s also rich in human history. The famous Group of Seven artists often took their inspiration from Georgian Bay’s harsh, bare shoreline and windswept islands. The Township of Georgian Bay is divided into three distinct communities, Port Severn, Honey Harbour and Mactier. Port Severn, located at the southern end of the Township marks the point where the Trent-Severn Waterway and Gloucester Pool flow into Georgian Bay. The Trent-Severn River is designated as a Canadian Heritage Waterway. Honey Harbour, known as a cottage and resort town, lies in the middle of the township on Lake Huron’s Georgian Bay. From here, cottagers access summer homes in the 30,000 islands and boaters can explore the fascinating Great Lakes. At the southern end of these islands is a small cluster of 59 islands designated as Georgian Bay Islands National Park. Just off the coast from Honey Harbour is Beausoleil Island, the largest of these islands. A little further north is the extraordinary Big Chute Marine Railway, in operation since 1917. This engineering marvel transports boats along rails in a giant carriage over a 19-metre rise between the Gloucester Pool and the Upper Severn River. MacTier, located near the northern edge of the township was originally called Muskoka Station when the Canadian Pacific Railway pushed through western Muskoka in 1906. It was a major maintenance terminal. Complete with a roundhouse and turntable, there were extensive shops for the repair of steam engines into the 1950s. Muskoka’s magnificent beauty with craggy cliffs, stately pines and abundant deer and other wildlife drew people from southern Ontario in the late 1800’s. W.H. Pratt, a successful hotel-owner in New York, heard about it and decided to build the first wilderness hotel at the head of a spectacular lake in 1870. He named this lake and another one nearby after a young friend called Joseph Rosseau, and called his hotel “Rosseau House”. In 1971 the Township of Muskoka Lakes amalgamated and is made up of several former townships including the Township of Cardwell, the Township of Watt, the United Townships of Medora and Wood, the Town of Bala, the Village of Port Carling, the Village of Windermere and a portion of the former Township of Monck. The municipal office is located in Port Carling. Encompassing 80 lakes, Muskoka Lakes has grown to be one of Canada’s major holiday destinations: its population soars from 6500 in the winter to 31,000 in the summer. The Township of Monck was named after Viscount Monck, Governor General of Canada at the time of Confederation. The township was organized as a municipality in 1869. Windermere came into being on January 1, 1868 when a post office of that name was established at Archibald Taylor’s sawmill at the mouth of the Dee River. It was named after Lake Windermere in the Lake District of England. The post office moved to the home of Thomas Aitken in 1870. Aitken’s home grew into Windermere House, one of the pre-eminent tourist resorts of Muskoka. The original settlers in the area were Frank and Elizabeth Forge, David and Ellen Fife, and Thomas Aitken. Lake of Bays is named after its major lake. This irregularly-shaped lake is fed by the Oxtongue River. It abounds with bays and inlets, a long peninsula named Port Cunnington, as well as several islands, and has access to over twenty communities. Established in 1971 from the former Townships of Franklin, Ridout, McLean and Sinclair/Finlayson (unorganized) as one of six area municipalities within the District of Muskoka. The largest island in the lake is called Bigwin Island, named after Chief Big Wind of Lake Simcoe who established three sacred burial grounds on this island, as well as a summer settlement. It still holds the remains of Bigwin Inn, a major resort that was popular in the early 20th century, and was a major steamship port-of-call from South Portage along with Baysville, Dwight, and Dorset. The permanent population of Lake of Bays has 3,000 residents and swells to 18,000 in the summer months.